Life doesn’t tend to run smoothly, with a measured, evenly spaced flow of demands and expectations. For business people it’s often a feast or famine situation, with several orders, customers and meetings to attend, frequently followed by a disconcerting lull. Parents may have child-related fairs, festivals and parents evenings in their diaries as well as having to juggle the other areas of their lives. Plus social invitations have a habit of occurring like buses, none for ages then six arriving all at once! At those times something has to give. Whilst we may have lots to do there’s also a need for us to manage stress, look after ourselves, take the pressure off and plan ahead. – Anticipate the busy times. You may be able to forecast when a busy period is likely to occur; it may be around holiday time, Christmas, before the school term starts or when the universities resume. You may not always guess correctly but it’s helpful to prepare for an influx of different demands. It may be useful to enlist help. Taking on an apprentice or forming alliances with complementary businesses may help you manage stress and take some pressure off as you support each other during those busy times. Or outsource some domestic chores or those business tasks outside your specific skill set. It could be money well spent. It may be appropriate to manage stress by sometimes declining work which you suspect could become excessively draining and demanding. It might be tempting to say ‘yes’, but’s it’s not always viable to accept every offer of work that comes your way. In quieter periods it may be fun, interesting and challenging to have a go and learn new skills, but it’s important to pick your time well. That’s where networking, making connections and getting to know local people in similar fields can become a win/win relationship for all over time. – Plan for your health. Batch cooking so you have healthy food ready to go can stop you reaching for the take-away menu or pre-chilled dinners. When you’re extra-busy is precisely the time when good nutritious food is especially important. There may be merit in sometimes declining invitations so that you go to bed a little earlier, rather than regularly collapsing exhausted in the early hours, mind racing, wondering why sleep is so elusive. Remember to allow yourself time for fun, exercise and your important relationships. Take breaks to manage stress and have personal time. You’ll return to work feeling better, often with clearer thinking. Cosset yourself regularly. Investing in your health and wellbeing will enable you to continue performing at your best. – Anticipate the lonely times. Take the pressure off and plan ahead for when you’ll potentially be bereft, alone and feeling unloved. Find out what’s happening locally, maybe register on mailing lists and suggest outings to friends, neighbours and colleagues. Often free or special offers can be found for shows, concerts and restaurants. Make and accept invitations, even if they sometimes take you out of your comfort zone. It’s okay to scare yourself a little from time to time! And think how proud you’ll feel afterwards, doing something different, making new friendships and keeping yourself busy. Plan for alone time by turning it into a special indulgent time. Take the pressure off and claim that time for yourself. Buy your favourite foods, organise your reading, music or viewing. Decide to have a lovely, relaxing, candle-lit bath, put clean sheets on the bed, have a treat of ‘me-time’ on your own. – Plan ahead for studying or a heavy workload. If there’s a period when you need to focus and really concentrate on work or a specific project you can take the pressure off by planning ahead. Identify what’s urgent, important and what can wait until another time. A timetable can help you focus, but you need to stick with it! Use those deadlines as a useful way to measure what you’ve done and how much more there is yet to do. A little forward planning can put you firmly in control. Being accountable may seem like a pressure situation, but used well, having to answer to another person can be constructive. It can keep you on track by refusing to allow you to go off course or become distracted. Knowing you have to check in regularly can keep you in the zone, clear about your immediate commitments and aware of each stage of the journey. 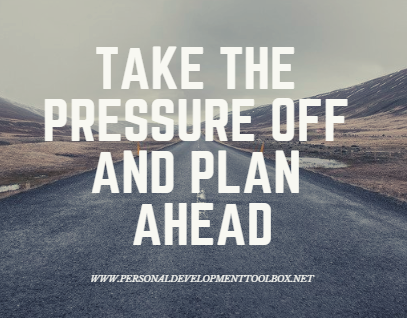 Taking time to plan and clarify your next steps can be time well spent, enabling you to feel more in control and less pressurised as a consequence.